Regardless of the type of tattoo, tattooing over and over in the same area of the skin will eventually cause scarring. And this certainly applies to scalp-micropigmentation multi-sessions (SMP-MS). I never refer to my System as “SMP,” as I do not offer SMP. I researched, developed and patented the single-session and permanent Weston System℠ for the very precautions covered here. I receive many complaints on a weekly basis from SMP-MS recipients who have gone through 5,6, 7 and even up to 11 sessions without any evidence of a single point of pigment on their scalp. More on multi-sessions. Every time the skin is broken, it is an injury. Rebreaking the same “injury” over and over eventually leads to scarring and sooner or later becoming one giant scar. The skin gets damaged every time you rebreak the skin so you can’t just keep tattooing it over and over in one place. There’s no point to these multi-sessions, as the skin is not going to hold any pigment. As a tattoo artist of almost 40 years, I have seen this in conventional tattooing with recoloring of tattoos. While the SMP-MS companies claim their application is *permanent, but also indicating only lasting 7-10 years. Few multi-session applications make it past the 3-5 year mark. Even during this time, perpetual touchups are required to keep it fresh-looking. Then at the 3-5 year mark, a complete reapplication is required. One company claims that their SMP-MS lasts 10 years, but the company has only been in business for five years. *Permanent is defined as “lasting or intended to last indefinitely without change.” Key words, indefinitely without change. Scarring begins to develop when the tissue beneath the skin is damaged so much that it cannot heal itself using conventional methods. If this is the case, your scalp will begin repairing and replacing this injured tissue with an alternative protein called *collagen. However, this collagen will never look or act as normally healed tissue, and therefore will usually be quite defined within the skin, either by being more raised/sunken than surrounding areas or being a slightly different color. *Collagen is a protein that is abundant in our bodies; it’s what helps give our skin strength and elasticity, along with replacing dead skin cells. Unfortunately, once tissue has been damaged enough to scar, the scars themselves are never likely to completely go away. This photo is the result of an eyebrow that was repeatedly pigmented over five years. You can notice the excessive raised scarring in the bulb area. The same eventually will happen to the scalp with repeated numerous applications. The scalp will also cease to accept any pigment readily through the scarring. Inexperienced SMP-MS techs don’t understand this problem and eventually end up blaming the recipient. 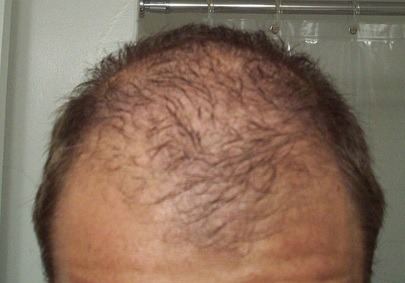 This is why I developed my patented one session, permanent lifetime application to avoid trauma like this to the scalp. How Will I Know if My Scalp is Developing Scarring? This man had eight multi-sessions from a Miami provider with zero results as his scalp micropigmentation faded away each time. In addition, reapplying pigment every 7 to 14 days for “sessions,” does not give your scalp enough time to heal in between. Your skin is healing in the early weeks and a minimum of 30 days should be the norm. And the more and more sessions, healing is prolonged even longer. The scalp becomes traumatized. Scarring will result even further when the SMP-MS tech now injects the needle in too deep (“burying” the needle) now out of frustration because your pigmentation keeps fading. The reasoning that deeper and harder will keep the pigment from fading. This results in an oversized “Sharpie” looking point. The pigmented area can also become very itchy. Any experienced tech knows how difficult it can be to apply pigmentation to hair transplant scars. Adding pigment to a hair transplant recipient’s scalp or a scar camouflage can be a challenge, as the tech is working with traumatized skin to start with. The individual whom receive numerous multi-session scalp micropigmentations will evenually be in the same situation, although not as dramatic. Some providers insist on “needling” the scar first. But in fact, that just creates additional trauma to the already scarred area, causing the likelihood of proper pigment acceptance slim. This Hibiscus tattoo was done in 2009 (copyright 2011) as applied over a burn caused by water scalding as a child on this woman’s arm. I designed the tattoo specifically for her arm and used the vivid colors of a hibiscus flower. The crinkled and unstable skin from the scar actually added to the realistic look of the Hibiscus pedals. This is a conventional tattoo where larger needles are used and pigment is placed deeper. Even with conventional tattooing, it was difficult to embed the pigment sufficiently for a long-lasting and colorful effect. It is recommended that you avoid SMP-MS (scalp micropigmentation multi-sessions) at all cost. Your scalp may look fine now after one initial set of sessions, but re-application afer reapplication will cause damage to your scalp in the future. You may then be unable to be a candidate for any furture hair loss treatments that are developed. A tattoo artist for over forty years, I am familiar with all types of skin over the entire body. Working on the scalp is unlike working on skin any place on the body. This is why I developed my patented one session, permanent lifetime application to avoid scarring and trauma to the scalp. 2 thoughts on "Scalp Micropigmentation Multi-Sessions Scarring"
Hello Mark I definitely and taking in your information on avoiding multiple sessions and it’s making sense to me. How do you get one session to last a lifetime how do you get the results that you’ve been speaking about? Are there ever any touch-ups 20 years down the road 30 years down the road? I’m also concerned about what kind of ink is used as I would only want something that does not contain harmful chemicals or toxins to be used on me can you comment on that also? Lastly do you have to go deeper into the skin to get a more permanent look than with multi session smp?